The fruit is low in calories. 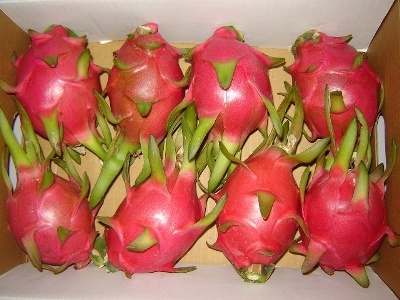 100 gm of 1 tropical dragon fruit contains about 60 calories. So it can be included in weight loss diets. Dragon fruits are rich in antioxidants. They help prevent the formation of carcinogenic free-radicals. They (especially red-skinned pitayas) are packed with vitamin C. Vitamin C ensures fast healing of bruises and cuts and helps improve the function of the immune system. Vitamin B2 acts as a multivitamin and helps improve your appetite. Vitamin B1 plays an important role in the production of energy as it promotes metabolism of carbohydrates. Vitamin B3 lowers bad cholesterol level and enhances the appearance of the skin by making it moist and smooth.The seeds of the fruit contain high polyunsaturated fatty acids. The fruits help get rid of heavy metal toxins from the body. They work great for asthma and cough. Carotene obtained from the fruits helps maintain and improve the health of the eyes. Proteins from the fruit help enhance metabolic processes in the body. The fruit serves as a food substitute for rice, especially for the diabetics. It can be used as cosmetic and health material, as it improves eyesight and prevents hypertension. It is a good material for beverages, delicious vegetable dishes, as it comes with high nutrition, low heat and vitamin C.
The fruits are rich in minerals, especially calcium and phosphorus. Calcium reinforces bones and helps in the formation of healthy teeth. Phosphorus aids in tissue formation. These fruits are low in calories and high in fiber. They help avoid constipation by acting as natural laxatives. They help improve the overall digestive health of a person. Fiber from the fruits enhances the process of digestion and helps control accumulation of fats.